The annual Poverty Conference at University of Lynchburg will kick off Hunger and Homelessness Awareness Week at 1 p.m. on Saturday, Nov. 8 in Sydnor Performance Hall, followed by a Poverty Simulation in the Burton East Room at 2:30 p.m. The keynote speaker will be Cheri Honkala, an anti-poverty advocate, co-founder of the Kensington Welfare Rights Union and co-founder and national coordinator of the Poor People’s Economic Human Rights Campaign. Throughout Hunger and Homelessness Awareness Week, some University of Lynchburg students will be sleeping outside in the Dell. 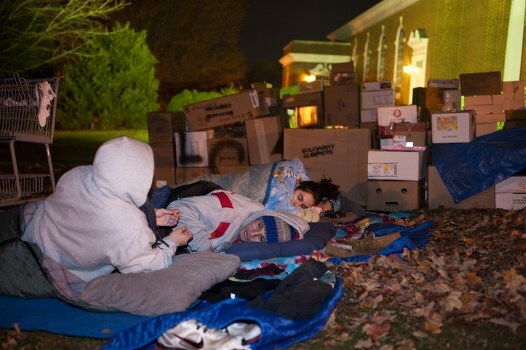 Students seek sponsors for each night to raise money for local homeless shelters. Read more in The Critograph and check out this video. Solidarity Sleepers began sleeping outside in the Dell for the week. The week’s events are sponsored by the Office of Community Involvement, Bonner Leaders and Spiritual Life Center. For more information, contact Chris Gibbons at 544-8640.